We don’t usually think of a microscope as an active instrument, but researchers in Canada have used a scanning tunneling microscope to remove or replace single hydrogen atoms from the surface of a hydrogen-passivated silicon wafer. If the scientific paper is too much to wade through, there’s an IEEE Spectrum article and a video that might run on the 6 o’clock news below. As usual with these research projects, there is good news and there is bad news. The good news is that — in theory — a memory device made using hydrogen lithography could store 138 terabytes per square inch. That’s enough, apparently, to store the entire iTunes catalog on a quarter. The bad news? Well, right now this takes exotic lab equipment at very low temperatures and pressures. The piezoelectric effect is simple in its rules: Apply mechanical stress to a material and you generate an electric charge. The inverse is also true: Apply a voltage to a material, and it changes shape. This doesn’t work for everything, though. Only certain materials like crystals, some ceramics, and bone have piezoelectric properties. The piezoelectric effect is used quite a bit in electronics, so it’s no surprise that plenty of hacker projects explore this physical phenomena. This week’s Hacklet is all about some of the best projects utilizing the piezoelectric effect on Hackaday.io! We start with [miro2424] and StrumPad. Strumpad lets you play a MIDI instrument by strumming, just like a guitar. A music keyboard acts as the guitar fretboard here – keys can be pressed to choose notes, but no sound is generated. When the strumpad is strummed, six copper strips act as capacitive sensors. Touching the strips determines which notes will be played. A piezo disc hiding below the circuit board detects how hard the notes have been strummed or tapped. The ATmega328 running the strumpad then passes the velocity and note-on MIDI messages on to a synth. Next up is [Dan Berard] with Scanning Tunneling Microscope. Inspired by a project from [John Alexander], [Dan] created his own Scanning Tunneling Microscope (STM). The key to an instrument like this is precise movement. [Dan] achieves that by using a normal piezo disk. These disks are used as speakers and buzzers in everything from smoke detectors to greeting cards, so they’re common and cheap. [Dan] cut his piezo disk electrode into quadrants. Carefully controlling the voltage applied to the quadrants allows [Dan] to move his STM tip in X, Y, and Z. Incredibly, this microscope is able to create images at the atomic scale. [Thatcher Chamberlin] is next with Low-Cost Touchscreen Anywhere. [Thatcher] used a trio of Piezo disks to make any flat surface touch sensitive. The three sensors are placed at 3 corners of a rectangle. Touches with the rectangle will create vibrations in the surface that are transmitted to the piezo sensors. By measuring the vibration time of arrival, it should be possible to determine where the surface was touched. This kind of measurement requires a decent processor, so [Thatcher] is using the ARM Cortex-M0 in NXP’s LPC1114FN28. Initial tests were promising, but we haven’t heard much from [Thatcher] on this project. If you see him online, tell him to hurry up! We’re hoping to turn our parking lot into a giant electronic chess board! Finally, we have [Jose Ignacio Romero] with Low Power Continuity Tester. [Jose] used a Piezo element in a slightly more mundane way – as a buzzer. Who needs a whole multimeter when you’re just trying to check continuity on a few circuits? This continuity tester uses a PIC12LF1571 processor to find open and short circuits. The 5 10 bit ADC in the PIC is plenty of resolution for this sort of tester. In fact, [Jose] even included a diode test, which emits a short beep if the leads are placed across a working diode. The PIC processor uses so little power that this tester should run for around 800 hours on a CR2032 watch battery. If you want to see more piezo projects check out our brand new piezo projects list! If I missed your project, don’t get buzzed! Drop me a message on Hackaday.io, and I’ll add it to the list. That’s it for this week’s Hacklet. As always, see you next week. Same hack time, same hack channel, bringing you the best of Hackaday.io! By the turn of the 19th century, most scientists were convinced that the natural world was composed of atoms. [Einstein’s] 1905 paper on Brownian motion, which links the behavior of tiny particles suspended in a liquid to the movement of atoms put the nail in the coffin of the anti-atom crowd. No one could actually see atoms, however. The typical size of a single atom ranges from 30 to 300 picometers. With the wavelength of visible light coming in at a whopping 400 – 700 nanometers, it is simply not possible to “see” an atom. Not possible with visible light, that is. It was the summer of 1982 when Gerd Binnig and Heinrich Rohrer, two researchers at IBM’s Zurich Research Laboratory, show to the world the first ever visual image of an atomic structure. They would be awarded the Nobel prize in physics for their invention in 1986. IBM’s Scanning Tunneling Microscope, or STM for short, uses an atomically sharp needle that passes over the surface of an (electrically conductive) object – the distance between the tip and object being just a few hundred picometers, or the diameter of a large atom. A small voltage is applied between the needle and the object. Electrons ‘move’ from the object to the needle tip. The needle scans the object, much like a CRT screen is scanned. A current from the object to the needed is measured. The tip of the needle is moved up and down so that this current value does not change, thus allowing the needle to perfectly contour the object as it scans. If one makes a visual image of the current values after the scan is complete, individual atoms become recognizable. Some of this might sound familiar, as we’ve seen a handful of people make electron microscopes from scratch. What we’re going to focus on in this article is how these electrons ‘move’ from the object to the needle. Unless you’re well versed in quantum mechanics, the answer might just leave your jaw in the same position as this image will from a home built STM machine. This is not an artist’s rendering, nor a physics simulation. 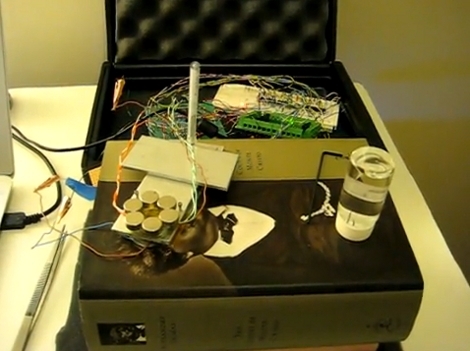 This device held together with hardware-store MDF and eyebolts and connected to a breadboard, is taking pictures of actual atomic structures using actual measurements. All via an 80¢ piezo buzzer? Madness. Gold atoms in a crystal. This apparent wizardry is called a scanning tunneling microscope which takes advantage of quantum tunneling. The device brings a needle atomically close to the object to be measured (by hand), applying a small voltage (+-15V), and stopping when it starts to conduct. Depending on the distance between the tip and the target, the voltage varies and does so precisely enough to identify whether an atom is underneath or not, and by how much. The “pictures” are not photographs like a camera might take from a standard optical microscope, however they are neither guesses nor averages. They are representations of real physical measurements of specific individual atoms as they exist on the infinitesimal area being probed. It “sees” by measuring small voltage changes. Another difference lies in the “scanning.” The probe examines atoms the way one would draw ASCII images – single pixels at a time until an entire atom was drawn. Note that the resolution – as shown in the pictures – is sub-atomic. Sizes of atoms are apparent as are the distances between them. In this they are closer related to the far more expensive Scanning Electron Microscope technology, but are 10-100x zoomier; resolving 0.00000000001m, or 0.00000000039″. One would presume that dealing with actual atoms requires precision machining vast orders of magnitude beyond the home hobbyist but, no. Any one of us could make this at home or in our hackerspaces, for nearly free. Apparently even sharpening a tip to a single atom is, as [Dan] says “not as hard to achieve as you might think!” You take some tungsten wire and pull on it as you cut so that it shatters diagonally. There are better ways he suggests, but that method is good enough. ChemHacker has posted schematics and code for a scanning tunneling microscope. [Sacha De’Angeli] finalized the proof-of-concept design for version 0.1 and released all of the information under the Gnu general public license version 3. 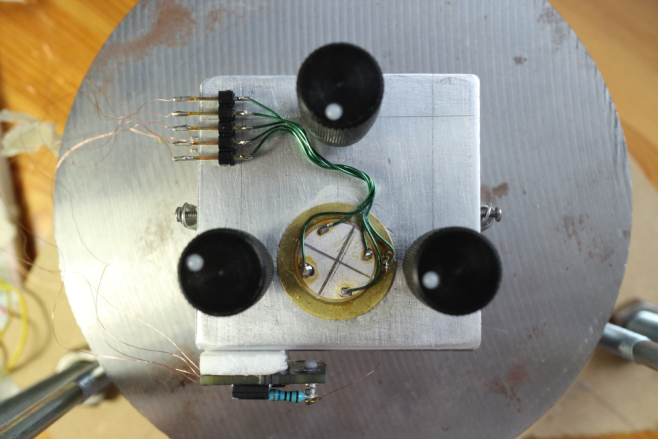 You’ll need to build a sensor from a combination of a needle, a piezo, and a ring of magnets. There’s an analog circuit that gathers data from the probe, which is then formatted by and Arduino and sent to your computer. We haven’t really dabbled in this type of equipment, though we did cover an STM earlier in the year. Take a look at the video after the break and then help jump-start are imagination by sharing your plans for this equipment in the comments.